As the World Bank representatives gather in Washington D.C. October 10-12, 2014, will it be business as usual, or will the Bank finally pay heed to a growing movement demanding food sovereignty? While the Bank proclaims that its business indicators “guide policy making,” in reality they mislead the public as to which economic and agricultural policies actually suit the nation’s needs and not moneyed interests. The BBA serves as a tool to push the Bank’s 2008 “agriculture for development” agenda,  which demands creation of land markets in developing countries and promotes a “productivity revolution in smallholder farming,”  through privatization, contract farming, and chemical inputs. By pushing governments to enact private-titling reforms for the purpose of “allocating land efficiently between those who want to buy, sell or lease land rights,”  the BBA will allow investors to take over land instead of protecting family farmers’ ownership. This is a grave concern given the trend of large-scale land deals that are dispossessing local communities in developing countries. In another instance, the BBA claims to support smallholder farmers through promoting imports of hybrid seeds and chemical fertilizers. Yet, this undermines countries’ food security as farmers become dependent on foreign oligopolistic seed corporations instead of strengthening traditional biodiversity-enhancing seed banks. It would be worthwhile for the Bank to reevaluate which agricultural producers truly deserve the World Bank’s support. Family farmers produce 70% of the food consumed worldwide and employ millions of rural people while stewarding the environment. Yet, the World Bank’s support of large-scale, monoculture agribusinesses reduces smallholder farmers’ access to the land and natural resources needed to support their livelihoods. Farmers—not big agribusinesses—are the primary investors in agriculture and should be supported by state-led programs that provide price insurances to national producers, knowledge-sharing platforms, and research on agroecological practices to raise farmers’ yields and income. In 2014, the Our Land Our Business campaign was launched to ask that the World Bank stop usurping countries’ sovereignty and facilitating the rampant theft of land and resources from some of the world’s poorest people through its annual Doing Business rankings and the new Benchmarking the Business of Agriculture project. It is time that the World Bank leaders recognize the harm they are inflicting on the very communities they claim to support. Join the action to tell the World Bank to do so at www.ourlandourbusiness.org, sign the petition, and come challenge the Bank with us in Rawlins Park, Washington D.C., Friday, October 10 at 4pm! 1. World Bank. “Investing Across Borders.” http://iab.worldbank.org/ (accessed September 30, 2014). 2. “Fact sheet: G-8 action on Food Security and Nutrition.” The White House, Press Release, May 18, 2012. 3. Agriculture for Development: World Development Report 2008. World Bank, 2007. http://siteresources.worldbank.org/INTWDR2008/Resources/WDR_00_book.pdf (accessed June 20, 2014). 6. Research carried out between 2009 and 2013 in 20 villages in Tanzania showed that formalization of property rights provoked “rising conflict, deepening poverty and inequality, exclusion of women and pastoralists and rising landlessness in some villages.” See Stein, Howard. 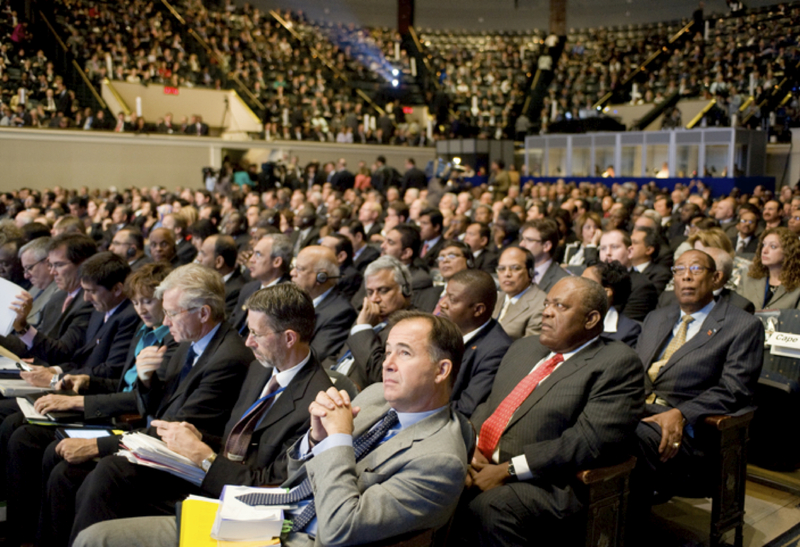 “The World Bank and Neoliberalism: Continuity and Discontinuity in the Making of an Agenda.” The World Financial Review, July 2014. http://www.worldfinancialreview.com/?p=2580 (accessed October 1, 2014). 8. Martin-Prével, Alice. Unfolding Truth: Dismantling the World Bank’s Myth on Agriculture and Development. http://www.oaklandinstitute.org/unfolding-truth. 9. World Bank. “Benchmarking the Business of Agriculture.” Project Overview. http://bba.worldbank.org/project-overview (accessed September 30, 2014). 10. Global Agribusiness: Creating Opportunity in Emerging Markets. International Finance Corporation, World Bank Group, 2011. http://www.ifc.org/wps/wcm/connect/17b1c500476244cdab45ef9022d5a78b/Agribusiness_Singles_Dec%2B14.pdf?MOD=AJPERES (October 1, 2014). 12. “Feeding the World, Caring for the Earth.” International Year of Family Farming, News, March 6, 2014. http://www.familyfarmingcampaign.net/en/news/2014/03/feeding-the-world-caring-for-the-earth (accessed October 1, 2014).